The time is now. The hero is you. A Massive Multiplayer Crossover in the form of an MMORPG made by Cartoon Network. Planet Fusion, a living planet made out of a green, gooey substance, has attacked Earth, and it's up to you, a bunch of animesque versions of characters from Cartoon Network series, and many, many other people to stop the alien invaders. The game has a simple but effective equipment system arming you with guns, swords, bombs, guitars, frisbees, and other items to defeat the opposition, while giving you shirts, pants, and shoes to protect yourself, while masks, helmets and capes/backwear are just for show. However, the biggest change to the MMO formula came with Nanos, miniature versions of Cartoon Network characters that are gained on level-up instead of stat bonuses. You can have three nanos with you at all times, and each has three abilities, of which each can only use one, granting you a variety of different layouts and choices, such as having Numbuh Two provide super speed, the ability to warp back to specific locations in dungeons, or increased money gain upon defeating enemies. After a long stint of no significant updates (beyond the disabling of the chat feature in June 2013), Cartoon Network Games finally announced the game's closing on August 23rd and granted all players max levels and unlimited funds until the game's final day on August 29th. There's also the wiki for your browsing enjoyment. There's also a spinoff set in the same continuity as the main game called FusionFall Heroes. Instead of being an MMO platformer like FusionFall, it's an overhead 3D action game ala Diablo with both a single player and online multiplayer opponent that lets you choose between various Cartoon Network heroes and take them into combat. Here's a preview. Here's the game. FusionFall closed on August 29th of 2013. Despite its cancellation, the game still has a massive cult following, with various petitions requesting it to be relaunched. After the petitions didn't lead to an official revival, more earnest attempts to start private servers came to light in 2015. 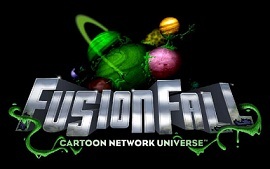 Originally, FusionFall Legacy aimed to start a private server with a rebuilt version of the game. In 2016, the FFL revealed that, with some help, they were able to create a new server with the original FusionFall client, as it was right before the first anniversary event in 2010. Closed alpha testing for the new private server with the original client, FusionFall Retro, was set for late-January. With the change of plans, FusionFall Legacy's focus shifted from being a private server for the original version of the game to a fully reimagined version of FusionFall, with Retro serving as a stopgap until Legacy's full release. With everythingnote Not premiering after the end of the game's release BUT Mike, Lu & Og, Sheep in the Big City, Robotomy, The Problem Solverz, and Whatever Happened to... Robot Jones?, showing up in some other way. Animesque: Done to pretty much everyone to a slight degree in an attempt to unify the varying art styles, but done most obviously (which is to say, really obviously) to the Powerpuffs and to Dexter. Reaction to the Puffs has been mixed, but the new, older, richer-and-Tony-Stark-like Dexter... uh, doesn't have any female detractors, at any rate. Crisis Crossover: With the threat of Planet Fusion assimilating the Earth, everyone, good or bad, is working to prevent the catastrophe. Silhouettes of Ed, Edd and Eddy and Samurai Jack are seen at the beginning but they don't play a role in the story. Likewise Coop and Jamie's silhouettes show up later but they don't notice the carnage going on outside. Charles Darwin Middle School, Endsville, and Orchid Bay also make cameos. Nice Job Breaking It, Hero! : The heroes think they've stopped the fuse spores and the source from where it's coming from. Turns out it was a beacon and by blowing it up they've brought Planet Fuse right to them. Not Me This Time: While Mojo had intended to do a scheme at the start of the story, the Fuse beat him to it and he has to stop Blossom from socking him to warn the heroes of the incoming threat. Prequel: Shows the starting invasion of the Fuse. Pungeon Master: Numbuh 2, but what else is new? Teeth Clinched Teamwork: Dexter grudgingly has to partner with Mandark. Took a Level in Badass: Mac and Bloo can fight, apparently. Know-Nothing Know-It-All: Bloo (as usual). Numbuh 2 asks this to Blossom and Bubbles about Buttercup but Numbuh 5 cuts him off. Likewise, Numbuhs 1, 3, and 4 are absent when the treehouse is attacked, yet they show up in the game itself. Abnormal Ammo: Mushroom spores to teddy bears, depending on the weapon. Allegedly Free Game: It was until April 19th, 2010, when it became just a Free Game. Antagonist in Mourning: After giving Buttercup amnesia in a deadly fight, Mojo Jojo displays a... surprising amount of guilt. Anti Poop-Socking: Upon gaining a certain amount of experience, both experience and money gained after that point is reduced by 50%, then dropped to 0%. It resets to 100% the following day. They've since removed the 0% feature, but it will still drop to 50%. Artistic Age: The Kids Next Door look older but it's unlikely that they are over thirteen. Their designs just have more realistic proportions for eleven or twelve year olds than they did in the cartoon. Bears Are Bad News: Did we mention the bears wield a jackhammer for an arm? BFS: The Rex Nano has a skill literally called "Big Freakin' Sword". Dexter's computer has an unrequited crush on Professor Utonium. Princess has a Precocious Crush on Ben. Crouching Moron, Hidden Badass: Billy, who actually helps out A LOT in the final stretch of the game. The whole game was slightly darker than the cartoons it's based off of, or at least those that weren't already dark. Musical example: In the CGI intro that showed up when you first accessed the site, a portion of an instrumental version of Thursday's "Jet Black New Year" played in the latter half. In the original version , the first half had a portion of an instrumental of Mastodon's "Crystal Skull" . Death Is a Slap on the Wrist: All it costs you is half the stamina of your current Nanos and cancels any benefits you might have had active (gumballs). It helps that Death is a character from one of the shows. Demoted to Extra: Mordecai, Rigby, Gumball and Darwin are all reduced to Nanos in this game as to actual Non Player Characters, possibly due to time limits or trouble with designing animal characters (as with Lazlo). And don't forget the brave sacrifice of Runty. So what's for lunch? Drama-Preserving Handicap: Megas has been trapped by fusion matter, hence why Coop can't just blow the crap out of Fuse's minions. Ben's Omnitrix also doesn't work due to interference. The rest can be chalked up to simple Gameplay and Story Segregation. Eldritch Abomination: Lord Fuse. Even more so when you find out he's the literal mind of the living planet causing all this mess. Evil Knockoff: "Fusion" versions of the main characters exist as field commanders for Planet Fuse's invasion. Gameplay and Story Integration: Defeated Lord Fuse, but wondering why he's still around next raid? Simple really. He's actually the physical avatar of the Genius Loci of Planet Fusion, so while defeating him is severely annoying, he just regenerates. Improbable Weapon User: Any fan of Codename: Kids Next Door knows that this trope is going to come into play at one point or another. The Powerpuff Girls wear them. There's also several versions girl characters can wear. True to the trope, they never go high enough for anything to be seen. Failing the trope, this only applies when the camera is straight. Aim it up and it no longer works. It also fails horribly when using a scooter-type vehicle, as the seated position of a character causes the skirt to be oriented vertically. However, all that's there is a blackened waist area, as if they were trying to make shorts but just got lazy and painted the skin. In one of the later updates, you can see shorts under some of the shorter skirts if you aim the camera juuuust right. Medium Awareness: True to the nature of the show he appears in, Chowder will occasionally recognize that he's in a video game. In a way. In the future, Eduardo hangs out in the cul-de-sac, and Samurai Jack hangs out at Goat's Junkyard. This can be justified in that Foster's is destroyed by the time the player arrives in the future and Eduardo, being the scaredy-cat he is, managed to escape the fastest. As for Jack, he never got a location based on his series. It may be to play up the crossover element and it's not unusual to see characters from several shows hanging out in one location, but Juniper Lee and Kevin Levin are in the middle of Nowhere while Grim holds court in Juniper's hometown of Orchid Bay. It's handwaved that Juniper made some sort of deal with Grim, since she originally couldn't leave Orchid Bay since she's a Te Xuan Ze. Due to the lack of Camp Lazlo characters, others fill the void (e.g, the Toiletnator and May hang out in Camp Kidney, Flapjack and Fuzzy Lumpkins are in Leaky Lake, and Gwen can be found at Pimpleback Mountains). Any fan of the shows the game represents will see at least five of these for each series. Various storefronts seen throughout the Suburbs and Downtown include Mushookies, The Pointier Image, Game Hive, Burger Frenzy, Cuppa Joe's and a toy store with a Rainbow Monkey in the logo. Various NPCs, including shopkeepers in Camp Kidney, are named after various Cartoon Network creators, including Craig McCracken and Genndy Tartakovsky. Named by the Adaptation: While Sector V's town continues to not have a name (the sign near the border has the name covered up by a board reading "Sector V"), Dexter's town got a name, Genius Grove. The Nanos, intended to have the cartoonish look that most of their NPC counterparts lost. Bloo is the wrong shade of blue. Plot-Relevant Age-Up: Dexter, the Powerpuff Girls, and the members of Sector V are in their (pre)teen years. Progressively Prettier: Debatable. Compare Flapjack ◊ in his original cartoon to Flapjack ◊ here. Reverse Mole: Players who have Mojo Jojo as their guide are sent by the villains on missions to further their evil goals. Heroes like Numbuh Two would then guide the player to sabotage those villainous plans. Rule of Cool: The only reason Samurai Jack is within walking distance of Megas XLR in the Future Zone. The game's unique naming system opens up quite literally several universes brim full of possibilities in regards to this trope, such as Xan Fireant. Before the game went to free to play, players were free to choose their own names, provided that they passed inspection. More obvious references to other media wouldn't make it through, but if what you named your character after was obscure enough (or obscure enough to whoever was in charge of approving your name), you were set. It's also an easy way to indicate characters that were made before the Free To Play switch. Starfish Aliens: They're all made of Fusion Matter, which is basically a green ooze that merges with whatever it doesn't destroy to make monsters, and some of them are warped clones of NPC's. Oh, and they exist to help their homeworld eat planets. Temporal Paradox: The nanos were created with information the player (if they joined before early 2011) brought back from a Bad Future, which (as of February 16, 2011) no longer exists, because everyone was better able to fight Fuse now... because of that technology from a time that doesn't exist anymore. The Bus Came Back: For many of the older CN shows/characters that at the time the game debuted (2008-09), since the network hadn't been running their shows regularly for some time. When TOM and the Clydes showed up for special events beginning in September 2011, he'd been cancelled back in 2008 (and had a completely different form; here he appeared in a form based off his 3.0 body) and the block wasn't revived until the year after. Additionally, the model of Clydes used here, the "living emoticon" Clyde 51s, were only used on Toonami during the summer of 2003. Timey-Wimey Ball: Until February 2011, the opening segment took place in a post-apocalyptic future the player was sent to due to a Deedee-induced time travel accident. After that, the opening was just basic training and the Timey-Wimey Ball seemed to have been removed—except there were still references to the Nano tech coming from the future. And CN's offical in-universe reason for the new intro segment? Due to the heroes' efforts, that future no longer exists. Video Game Settings: Many and varied, all stuffed into a Patchwork Map. Jungle Japes: The northern part of the Wilds, starting with Twisted Forest. The Lost Woods: The southern part of the Wilds, based on Camp Lazlo. Shifting Sand Land: The eastern part of the Wilds, based on Courage the Cowardly Dog. Warp Whistle: Flying Monkeys, courtesy of Mojo Jojo, and the KND's S.C.A.M.P.E.R. The S.C.A.M.P.E.R. instantly warps you to your destination, which has a wider range, but there aren't as many compared to the Flying Monkeys, which there are more of around the world, but their range is more limited and the warp isn't instantaneous. What Does This Button Do? : The mistress of this trope, Dee Dee, sent you into the future because of this in the old tutorial. Zettai Ryouiki: All three Powerpuff Girls. Follow the Leader: Basically a Lighter and Softer Diablo. Synchronous Episodes: Takes place at the same time as the original game, showcasing what the main characters of the cartoons were doing during the battle.